You are here: Home / New to AA? / Young and Drinking? When is drinking becoming a problem? 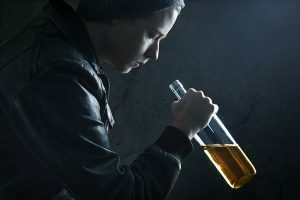 Alcoholism is a rough word to deal with, yet nobody is too young (or too old) to have trouble with booze. That’s because alcoholism is an illness. It can hit anyone; young, old, rich, poor. black, white and it doesn’t matter how long you’ve been drinking or what you’ve been drinking. It’s what drinking does to you that counts. To help you decide whether you might have a problem with your own drinking, we’ve prepared these 12 questions. The answers are nobody’s business but your own. If you can answer yes to any one of these questions, maybe it’s time you took a serious look at what your drinking might be doing to you. If you do need help or if you’d just like to talk to someone about your drinking, call us on 020-625.60.57 (24 hours per day) or write to us in confidence or e-mail us at help@aa-netherlands.org. Do you drink because you have problems? To face up to stressful situations? Do you drink when you get mad at other people, your friends or parents? Do you often prefer to drink alone, rather than with others? Are you starting to get low marks? Are you skiving off work? Do you ever try to stop or drink less – and fail? Have you begun to drink in the morning, before school or work? Do you gulp your drinks as if to satisfy a great thirst? Do you ever have loss of memory due to your drinking? Do you avoid being honest with others about your drinking? Do you ever get into trouble when you are drinking? Do you often get drunk when you drink, even when you do not mean to? Do you think you’re big to be able to hold your drink? Alcoholics Anonymous is a fellowship of men and women who share their experience, strength and hope with each other that they may solve their common problem and help others to recover from alcoholism. The only requirement for membership is a desire to stop drinking. There are no dues or fees for AA membership; we are self-supporting through our own contributions. AA is not allied with any sect, denomination, politics, organisation or institution; does not wish to engage in any controversy, neither endorses nor opposes any causes. Our primary purpose is to stay sober and help other alcoholics to achieve sobriety.